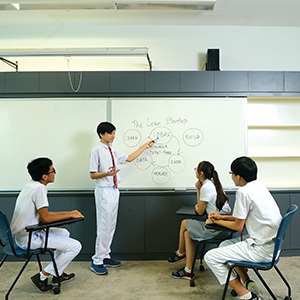 The school offers three courses in the Applied Learning Programme (ALP) for Secondary 3 students. I took the mobile application development course, where I learnt how to create mobile applications using the application ‘Scratch’. During the first part of the course, the instructor taught us how to use the software, how to connect databases to the application to store data, which allows us to do many things like creating a chatting app with friends. After the first few lessons of learning how to use the software, the instructor got us into groups to start a project to make an application of our choice. During the course of the programme when we were making our app, the instructor would check on us, making sure everything was okay and would provide help when needed. The mobile application development course was overall a really enjoyable experience where students get to learn how to make mobile applications during curriculum hours and even get the chance to make one for themselves. This equips students with useful skills which could come in handy later on in life if they were to take up other courses on programming as they would already have basic knowledge of programming. Hence, this was a very fruitful course as almost everyone owns a smartphone in today’s society. Knowing how to make applications may turn out to be a really good skill to have in this day and age. Of all three courses offered in Edgefield’s Applied Learning Programme (ALP), the course that i took was Digital Marketing. Our assignment was to help promote the school’s Open House 2018 through digital marketing. In digital marketing, we learned skills such as creating video advertisements and starting a campaign. The course was really meaningful and helped us gain a lot of knowledge in marketing, as it was filled with a lot of hands-on activities, accompanied with fun and encouraging instructors. Before we were able to officially start promoting the school’s Open House 2018, we were first required to start a campaign which lasted for 2 weeks. During the first few lessons, the instructor taught us how to create advertisement videos that attract customers’ attention easily, how to film people the right way with different methods to be able to bring out our focus of the video or the advertising product. A product was given to each group and we were task to create a short video advertising our given product. Being direct was essential in our video content, as we were required to translate our words to viewers easily without boring them. We were exposed to various types of campaign styles and how these have been done by other companies, to help inspire us. All in all, the course was really an enriching one. This course provides students with knowledge that is rarely taught during school hours. Learning the skills of digital marketing is really beneficial especially in the future when we ourselves step out into the working world. It has helped us gain a clearer understanding on creating campaigns and advertisements for companies. Therefore, I am thankful to the school for opening up this course to the students, allowing me to gain such an experience! Learning Taekwondo has taught me numerous life lessons such as to persist and not to give up easily as well as to do my best in whatever I do, as said in the taekwondo pledge. Taekwondo has also taught me useful skills like self-defence which will come in handy in the case of being assaulted. I find Taekwondo lessons fun and interesting as we learn new things every week. It has also helped me make new friends from other classes that i would not have had the opportunity to get to befriend otherwise. The coaches are friendly and willing to help students who have difficulties understand the weekly routine. Our Taekwondo lessons can also help alleviate stress after a day of lessons and keep us energised for the rest of the day. 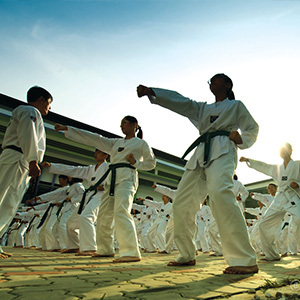 Overall, Taekwondo lessons are highly enjoyable, yet, they also teach us many valuable lessons, skills and values such as resilience, perseverance and to hone a fighting spirit in all that we do. After participating in Taekwondo lessons for almost 2 years, I feel that it has helped me in many different ways. For example, when I first started, I was a little shy and worried that Taekwondo would be tough. Gradually, after several lessons, I overcame my fear of being shy in portraying my Taekwondo skills in front of everyone. Taekwondo has thus helped me in building up my confidence levels and has taught me to step out of my comfort zone. I have also learnt to show respect and sincerity towards others throughout my journey in Taekwondo. This is practised during our lessons, as we have to bow to instructors, teachers and fellow classmates, as a form of respect and sincerity. More than just curriculum lessons, Taekwondo has also become one of my personal interests and I can really see myself benefiting from this lifelong skill. With Taekwondo being a part of the Edgefield curriculum, it has helped me increase my self-defence abilities and without this curriculum being part of Edgefield, I would never have had a chance to obtain the martial arts skills that I have today. The Future Ready Curriculum is a new programme introduced just this year. Its goal is to teach and manifest new skills that will staunchly benefit the future of students that was once obscured. It offers students a wide selection of modules to choose from, ranging from Leadership to Entrepreneurship. 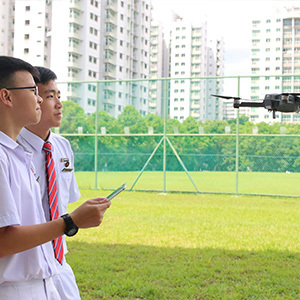 Ultimately, it aims to equip pupils with the correct tools to tackle the different challenges they will eventually encounter in the future. Hence the name “Future Ready Curriculum” (FRC). In this reflection-esque write up, I will be talking about my experiences in the programme so far. Before that, let me start by saying this has been enjoyable so far and is certainly a new yet refreshing way to impart important knowledge to students that they will find handy later on during their life. I was selected to be in the leadership module, and as the name suggests, it’s a course dedicated for enhancing the management skills of a student, thus pronouncing it further. At the start of every lesson, the instructors engage us in a short activity that was thoroughly planned beforehand. The activities themselves were quite fun and exhilarating; it forces us out of our comfort zones, making us interact with schoolmates from other classes or even from different streams. Initially, it did not seem like the games had anything to do with leadership, but after listening to the instructors and doing our own personal reflections, we realized that we had learnt something while playing the games such as how to properly form a team, how to deal with disagreements, etc. The instructors end off each session with a survey, which I think, is a great way for them to know which areas of the lesson they need to improve on and what they have done well. Overall, the FRC programme has been a unique and interesting way to teach students essential life skills and improve their critical thinking ability. I, along with many other students, look forward to what it has in store for us next year. I think that the Apple Education Programme helped us to learn more about the IT world and raise awareness of cyber threats. I really enjoyed the classes and the teachers were really kind. Most importantly the activities were interesting and taught us new skills. I really miss the lessons and hope that we can experience more of these non-academic programmes. In my experience with Edgefield Secondary's Apple Education Programme (AEP), I can say that the programme has been very useful. It has taught me a lot on how to use Apple products, such as iMac and iPads, and their basic functions and apps. As a secondary 1 student, I was taught on how to use ‘iMovie’, which is a handy video editing programme that can be used for project work. We created a short video clip as a tryout and discovered many tools and functions that the app had to offer. Other than learning how to use Apple products, we also learnt about Gmail and Google Classroom, which are apps that are often used in our school. We also had lessons on Cyberwellness and online safety so that we can protect ourselves when using social media, and create a safe environment online for everyone. To conclude, the programme has been highly beneficial as the skills and knowledge taught can be used for lessons in school and in the future. I would also use “fun” to describe the programme as we had many opportunities for hands-on experiences during the lessons.